Join in for a fun urban group hike through the city, capped off with celebratory drinks at the end. The hike will begin at Glen Park BART, then they’ll hike up through Glen Park Canyon. The park incorporates free-flowing Islais Creek, an extensive grassland with adjoining trees, striking rock outcrops, and arid patches covered by “coastal scrub” plant communities. Following that, they’ll cross over Portola to explore Mount Davidson, at 927 feet, it’s the highest point in San Francisco. This 40 acre park has expansive views, so let’s hope for some sunshine. 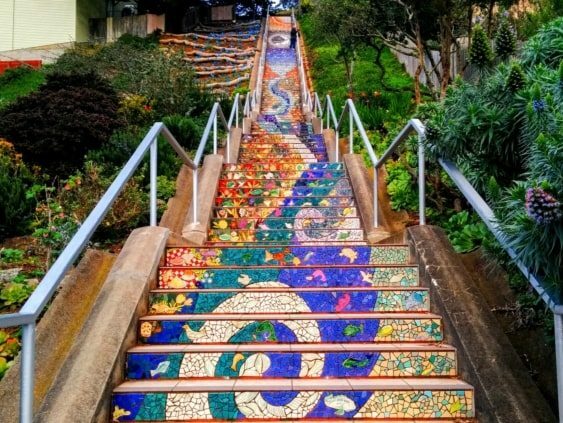 After that, they’ll meander through West Portal toward the Mosaic Stairs at Moraga/15th Avenue. At the top of this gorgeous stairway is Golden Gate Heights. This is one of the most spectacular views of the city. After the hike, everyone is welcome to join in at Sunset Reservoir Brewery on 24th/Noriega for a bevvie. They’ve reserved the top area for everyone to gather after the hike, but bring money along for your drink purchases. This is an a-b hike; the group will not be returning to Glen Park BART, but there are buses and trains near the brewery. As you know, we will experience every microclimate possible. Bring water; it’s good to hydrate. Please note, this hike will cancel if it rains sideways, but even then, they would just look for rainbows. Please note, no dogs are allowed.